We already know how much dampness in a home costs. That in itself is not good but we wondered what effect it might have on the value of the home. So we went to House Buy Fast, a professional property buying company who purchase 100’s of homes across the UK every year. We asked Director, Jonathan Rolande to value a 3 bedroom home in Exeter, Devon before and after we went in to remove hundreds of kilos of cold, wet insulation that was playing havoc with the home. Jonathan said “well, a surveyor would probably value this at zero until the issue is sorted out, it’s completely unmortgageable for a normal buyer. A professional buyer must also consider this but would still offer. With all the issues the damp has caused? You’d be lucky to get £100,000”. So there it is. A simple issue like wet insulation could affect the value by £45,000! And the cost of safely removing the insulation and allowing the property to breathe and dry as it should? Well under £2000 with everything left clean, tidy and all insulation and debris taken away. If you’re worried about dampness, simply contact us for a free, no obligation survey and the advice you need. 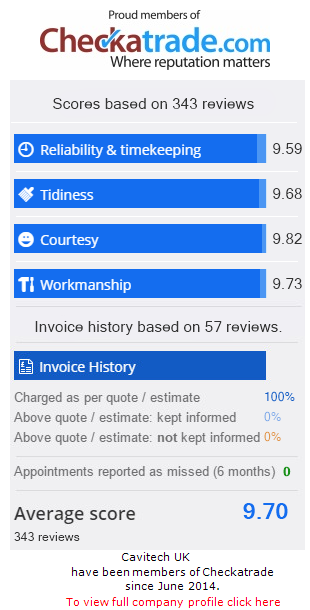 Check out our stellar reviews on Checkatrade if you’re not convinced, our rating is 9.84 out of 10 which we’re very proud of!